Sensory cells of the mouse intestine let the brain know if certain compounds are present by speaking directly to gut neurons via serotonin. 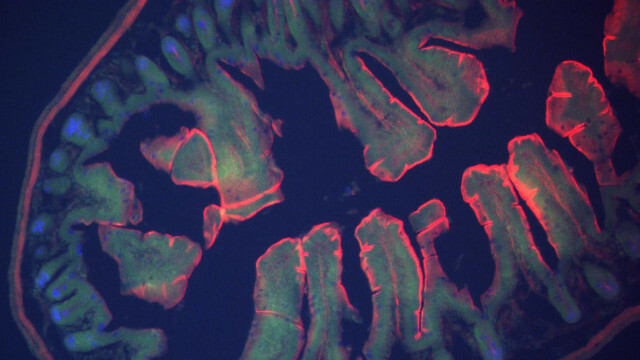 Mouse intestineWIKIMEDIA, KELVINH88The intestine tells the brain about the contents of the gut. But insights into the molecular mechanics of this gut-brain conversation have been stalled by technical limitations. Now, examinations of a key type of gut sensory cell within mouse intestinal organoids and tissue sections have revealed which molecular signals activate these so-called enterochromaffin cells, and how the cells relay the compounds’ presence to the central nervous system. The findings are reported today (June 22) in Cell. Enterochromaffin cells are a type of intestinal epithelial endocrine cell. 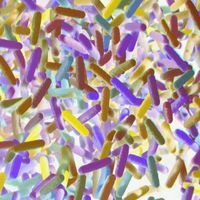 They are very rare—making up less than one percent of the intestinal epithelia—and yet are responsible for the production of 90 percent of the body’s serotonin. It has been proposed that these cells act as chemical sensors, detecting molecules in the gut lumen and, in response, secreting serotonin to trigger neuron-controlled gut motility, contractility, and pain. But what those luminal molecules might be, and how serotonin exerts its effects on neurons, was a mystery. “The question is, does serotonin just spill out and interact with neurons at a distance—which almost certainly happens—or is there also a more point-to-point connection” between neurons and enterochromaffin cells, says neuroscientist David Julius of the University of California, San Francisco, who led the research. There is a precedent for such synaptic connections, he says, explaining that a related set of gut epithelial cells—called enteroendocrine cells—has recently been reported to make direct neuronal contacts. Because of the scarcity of enterochromaffin cells they “are very difficult to play with in vivo,” says Cryan. 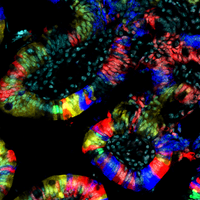 Therefore, Julius and colleagues employed a recently developed in vitro organoid approach to recapitulate the complexity of intestinal tissue in the accessibility of a dish. In intestinal organoids derived from mice, the team examined enterochromaffin electrophysiology, protein expression, serotonin secretion, and more. They found that these cells express voltage–gated ion channels and are electrically excitable—a hallmark of sensory cells. Then, from a screen of 30 possible gut lumen compounds, they found several that could trigger enterochromaffin excitation. These were allyl isothiocyanate (the irritant found in wasabi and other mustards), isovalerate (a fatty acid produced by gut microbes), and the catecholamines dopamine, epinephrine, and norepinephrine. The team went on to show that enterochromaffin cells expressed relevant receptors for these compounds and that compound-induced activation of the cells prompted the release of serotonin. Next, using mouse gut tissue samples from mice with fluorescently labeled enterochromaffin cells, the team examined these cells’ relationships to neurons. The researchers found that innervating neurons expressing serotonin receptors frequently appeared to make contact with enterochromaffin cells and that enterochromaffin cells expressed presynaptic proteins, while adjacent neurons expressed postsynaptic proteins. These results all pointed to these cells directly talking with one another. Moreover, stimulation of gut epithelium with norepinephrine or isovalerate triggered the activity of these innervating cells. 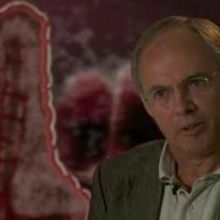 The finding that enterochromaffin cells form synapses with neurons “indicates there is a direct link to the brain,” says gastroenterologist Rodger Liddle of Duke University who found the previous link between enteroendocrine cells and neurons, but who was not involved with this work. Such a link would allow transmission “in milliseconds rather than minutes,” Liddle explains. One role of the gut-brain axis is thought to be as protection against disagreeable substances, where a rapid response may be critical, he says. “If you ingest a toxin or something that is detrimental, then these cells, because they are chemosensors, will respond and may send signals to induce vomiting or diarrhea, for instance,” Liddle suggests. There is still a lot to learn about how the gut talks to the brain, says Cryan, and about what happens to the brain, gut, or both when the system goes awry. The work of Julius and colleagues has certainly “filled in some pieces of the puzzle,” he says. It has also identified key molecules and mechanisms “that would be nice to now investigate in vivo,” he adds. N.W. 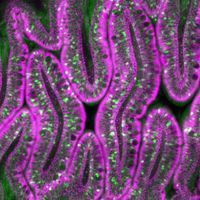 Bellono et al., “Enterochromaffin cells are gut chemosensors that couple to sensory neural pathways,” Cell, doi:10.1016/j.cell.2017.05.034, 2017.